This has long been a major gambling game at large casinos and baccara is actually the original version of baccarat and punto banco. Played mainly in casinos located around Europe, this game is extremely popular at casinos in cities around France and Germany. Baccara regularly features high-stake bets and some games at casinos can apply high minimum betting stakes. Baccara is one of the highest staking casino games and is regularly played as casinos throughout the world. Dating back many hundreds of years, baccara originates from Italy and often when playing this game there is no fixed stake limit. Many baccara players place large bets and fortunes can be lost and made at casino tables. The game of Baccarat (which is pronounced with a silent 't') features similar rules and payout odds, and is also known as Punto Banco. Baccarat is generally the name used in the United States of America (USA), and Punto Banco is the term used in the United Kingdom (UK), where this simplified version of the game originated. 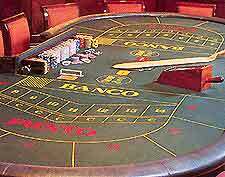 At the start of the game of baccara, the banker makes an initial bet, known simply as the 'bank', 'banque' or 'banco'. This banker's bet can be any amount that is over the minimum bet limit on the table. There is no upper limit for the banker's bet. The card game of baccarat is thought to have Italian origins, although was extremely popular in France during the late 15th century. A variation in the USA and Canada is known as 'North American Baccarat' or 'Punto Banco', while 'Banque' and 'Chemin de Fer' are yet further versions played in many world-wide casinos.